Growing up in a moderately sized Italian household, we always seemed to have family around, especially at dinner time. Gathering around the kitchen table to chat and eat was a regular occurrence at our house or should I say my grandma's house. The family gathered there many a night to break bread, and enjoy each other's company. In those days you never had to call ahead to see what grandma was making or if there would be enough. There seemed to always be a large endless pot of something, depending on the day, brewing on the stove. It was almost like she knew we were coming. Meal options looked like this, Sunday, Tuesday & Thursday, there was macaroni and gravy. Monday was always chicken soup, Saturday a platter of some sort and on Friday there was always fish. Saturday platters offered the biggest variation to this regime. My grandmother always seemed to come up with something different on platter night. When I came across this recipe from Lidia Bastianich I couldn't help but think this would have been perfect for those nights all of us kids and grand-kids just showed up to see what was cooking. Rinse the chicken and pat dry with paper towels. Trim off excess skin and all visible fat. Pour the 1/2 cup oil into the skillet and set over high heat. Sprinkle the chicken with 1/4 teaspoon salt on all sides. When the oil is very hot, lay the pieces in it, skin side down, an inch or so apart. Don’t crowd the chicken: if necessary, fry it in batches. Drop the pancetta into the oil around the chicken, turning and shifting them often. Let the chicken pieces fry in place for several minutes to brown on the underside, then turn and continue frying until they’re golden brown on all sides, 7 to 10 minutes or more. Let the pancetta cook and get lightly crisp, but not dark. Adjust the heat to maintain steady sizzling and coloring; remove the crisped chicken pieces with tongs to a bowl. Meanwhile, rinse and dry the potatoes; slice each one through the middle on the axis that gives the largest cut surface, then toss them with the olive oil and 1/4 teaspoon salt. When all the chicken and pancetta is cooked and out of the skillet, pour off the frying oil. Return the skillet to medium heat and put in all the potatoes, cut side down in a single layer, into the hot pan. With a spatula, scrape all the olive oil out of the mixing bowl into the skillet; drizzle in a bit more oil if the pan seems dry. Fry and crisp the potatoes for about 4 minutes to form a crust, then move them around the pan, still cut side down, until they’re all brown and crisp, 7 minutes or more. Turn them over, and fry another 2 minutes to cook and crisp on their rounded skin sides. Still over medium heat, toss the onion wedges and rosemary branches around the pan, in with the potatoes. Cut the seeded halves of cherry peppers into 1/2-inch-wide pieces and scatter them in the pan too. Return the chicken pieces to the pan, along with the pancetta; pour in any chicken juices that have accumulated. 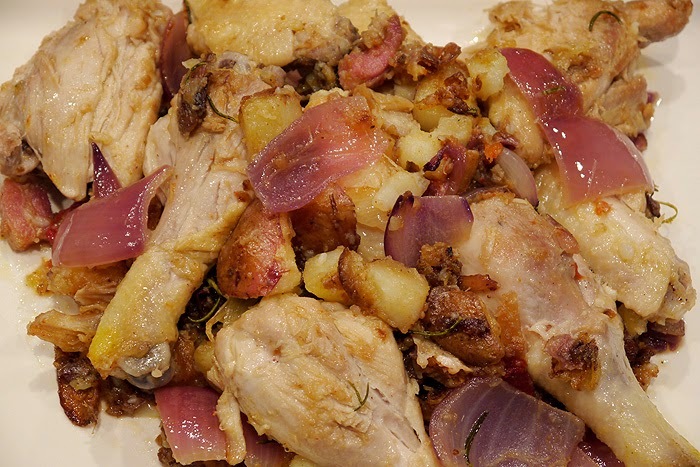 Raise the heat slightly, and carefully turn and tumble the chicken, potatoes, and onion (and pancetta and pepper pieces), so they’re heating and getting coated with pan juices — but take care not to break the potato pieces. Spread everything out in the pan — potatoes on the bottom as much as possible, to keep crisping up — and cover. Return the heat to medium, and cook for about 7 minutes, shaking the pan occasionally, then uncover, and tumble the pieces and potatoes again. Cover, and cook another 7 minutes or so. Give everything another tumble. Now cook covered for 10 minutes more. Remove the cover, turn the pieces again, and cook in the open skillet for about 10 minutes, to evaporate the moisture and caramelize everything. Taste a bit of potato for salt, and sprinkle on more as needed. Turn the pieces now and then; when they are all glistening and golden, and the potatoes are cooked through, remove the skillet from the stove and serve. looks exactly like what my Italian grandmother would have cooking in a electric skillet half a century ago...her version had lots of celery as well as potatoes and onions...so simple but memorably delicious! My husband grew up in a big Italian family and he tells similar stories about dinner at his grandparents' house! Such a simple recipe - but such amazing flavors! I'm Italian so I can so relate to this post. Looks delicious! What wonderful memories of your grandmother's kitchen. I'm sure some amazing dishes came out of it! This looks like a wonderful comfort meal. This look so inviting - i want to dig in! I love this. Chicken & potatoes is a staple here. Love Lidia, I saw her live in Toronto, she is just the sweetest lady. MMM, the chicken with pancetta and the cherry peppers - what a delicious combo! Memories of grandmoms/great grandmoms in the kitchen are some of the best ones for me!